Every Friday, Future Tense rounds up the best robot videos of the week. Seen a great robot video? Tweet it to @FutureTenseNow, or email us. This week, a scary look at civilian drones, a new mode of transportation when flying isn’t good enough, and a quadrotor that learns from its mistakes. If real wars can be fought with remote-controlled killing machines, why not fight pretend, recreational wars the same way? The shadowy figures at DangerInfo.tv, a video site claiming to “reveal secrets ‘they’ don’t want you to know,” put together this fully functional paintball drone. While it looks like a good way to step up the intensity in a paintball arena, the idea behind it is quite a bit scarier. The drone is a proof of concept to show that a do-it-yourself gun drone is possible with easily accessible equipment and instructions. It might seem terrifying that anyone with enough interest could put together a weapon like this, but as Evan Ackerman notes on IEEE Spectrum’s Automaton blog, this is hardly a new idea, and it’s not even the scariest iteration of this concept. Before you start pondering how to stop robots from enabling these scenarios, read Ackerman’s assessment of the danger. Spoiler alert: The issue is about guns, not robots. I grew up with a parrot in the house, and the most valuable life lesson it taught me was to stay away from parrots at all cost. They’re clever, they’re full of rage, and they scream bloody murder because they like the sound of pain. 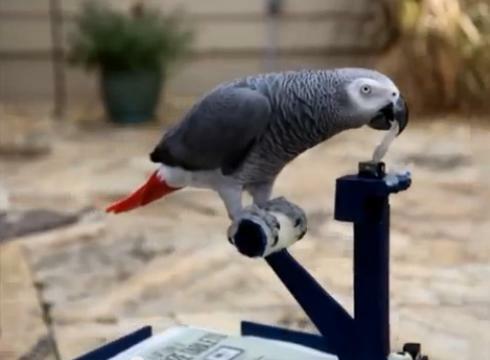 The BirdBuggy, designed by University of Florida student Andrew Gray, was built to address that last problem—his bird Pepper, whose wings are clipped, would screech whenever Gray wasn’t around. He first set up a robotic squirt gun to silence the beast, but that backfired when Pepper started using it as a birdbath, according to UF’s campus newspaper the Alligator. He had more success with the BirdBuggy, which lets Pepper scoot around the house and seems to have quieted things down. A small, beak-friendly joystick lets Pepper guide the rover around, and sensors in front keep it from bumping into anything. And when it’s not being steered around, BirdBuggy goes into autonomous mode, guiding itself back to a dock. This might be one way to keep the noise down, but an electric scooter is a major downgrade for an animal that was born to fly. If you’re still shaking from the idea of the gun drone, just remember how hard it is for even the most agile quadrotors to stay aloft. Small fluctuations in air pressure can throw a bot off course, and if there’s any obstacle nearby, the chances of a crash are pretty good. Researchers at the Swiss Federal Institute of Technology Zurich designed the system shown here to help a drone learn from its mistakes when navigating obstacles. A series of cameras track the quadrotor as it navigates the slalom course and analyzes the path to correct any mistakes the bot made in transit. Within 10 tries, the bot can master the tricky challenge—and as you’ll see at the end of the video, it’s a huge improvement over the initial run. This robot from the University of Tokyo takes the term “humanoid” a little too seriously. Not content to be a generally human-like robot, this machine was built to mimic human movement with extreme detail. The robot, named Kenshiro, has 160 “muscles,” with 50 of them in the legs alone. The muscle-work gives Kenshiro a lifelike range of motion, and an innovative pulley system kept Kenshiro from being ridiculously heavy for its size. (Check Automaton for pictures of the muscles.) The final product checks in at about 110 pounds, making Kenshiro roughly equivalent in stature to an average Japanese 12-year-old boy. And if you’d like to save up for some killer Halloween decorations next year, you can’t go wrong with that disembodied dancing ribcage. -The holidays are here, and if you’d like to share the gift of robotics with your loved ones, look no further than Robots.net’s gift guide. -The robot that completed its trek across the Pacific last week gathered all kinds of data for life at sea, including a look at unpredictable rogue waves. More from Scientific American. -Apps aren’t just for smartphones anymore. RobotAppStore, the first marketplace to distribute robot software, landed some new investment in its pursuit to develop cloud robotics. More from VentureBeat.